1879 Miniatures Wargame Core Rulebook – FASA Games, Inc.
Victorian-era British troops with steampunk vehicles face off against Babylonian descendants with weird-science technological zombies! In the war of coal and steam against railguns and undead, who will win? 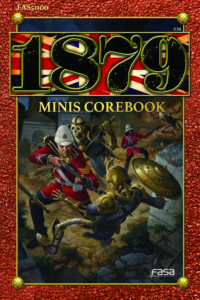 FASA Games, Inc., presents the 1879 Miniatures Core Rulebook. This volume contains the combat rules, model and unit build rules, and basic Order of Battle for the British and the Samsut. Together with miniatures from Ral Partha Europe, this book lets you fight it out for control of the Grosvenor Land, a new world on the far side of an interdimensional portal from Victoria’s Earth. The British Empire, passing through the portal, has found a new world, the Gruv, chock-full of resources and land to be exploited. In the process, though, they’ve run headlong into the Samsut, descendants of ancient Babylonians who’ve been living there for over three thousand years. Now the might of the Empire clashes with the weird science of the Samsut. The Saurids, a reptilian race native to the new world, contest with both empires to retain their ancestral lands. Who will control the Gruv? That’s up to your battles to decide!